2 What is Allergy? An exaggerated immune response to normally harmless substances such as: food, mold spores, dust mites, insect venoms, trees, grasses, weeds, medications and chemicals. 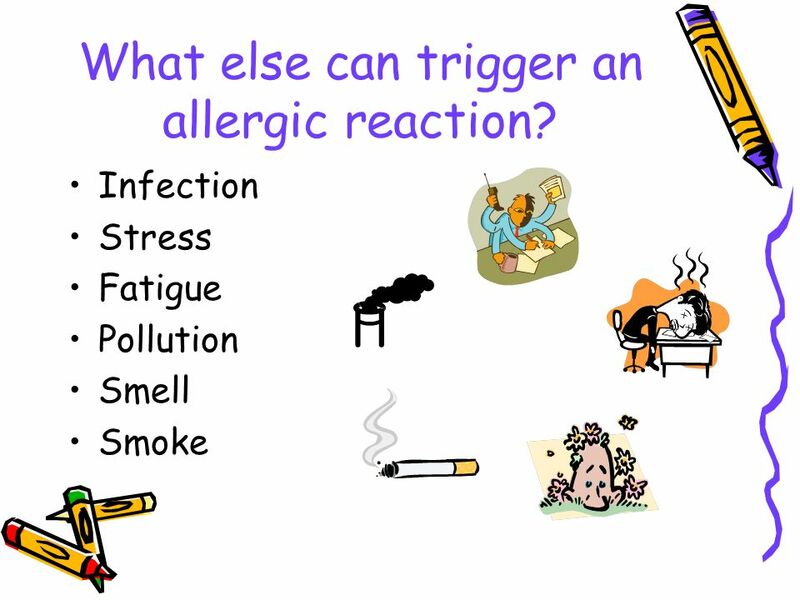 3 What else can trigger an allergic reaction? 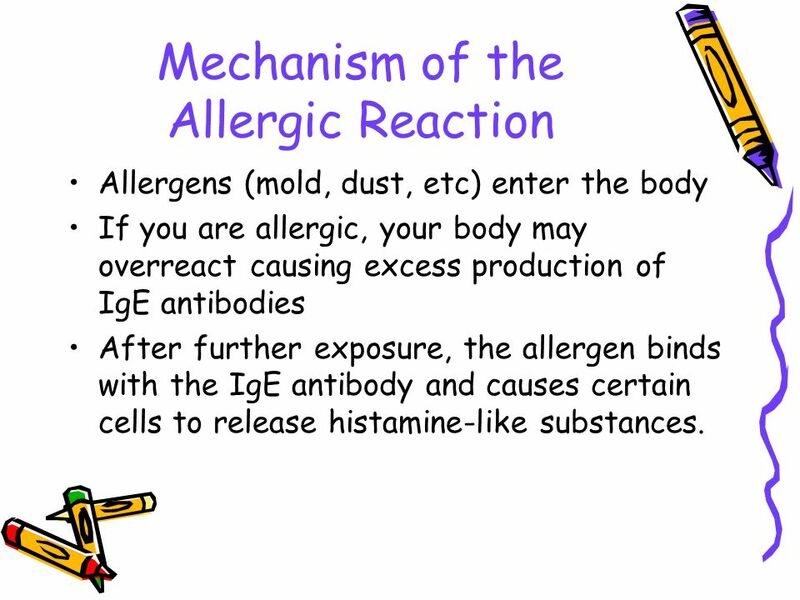 Allergens (mold, dust, etc) enter the body If you are allergic, your body may overreact causing excess production of IgE antibodies After further exposure, the allergen binds with the IgE antibody and causes certain cells to release histamine-like substances. 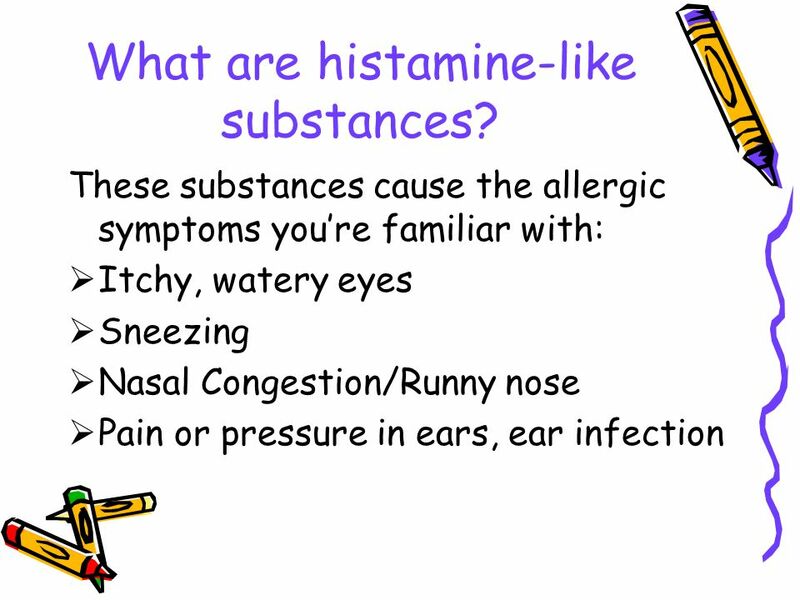 5 What are histamine-like substances? 6 What are antibodies? Antibodies are the body’s “soldiers” and normally they serve to protect us. 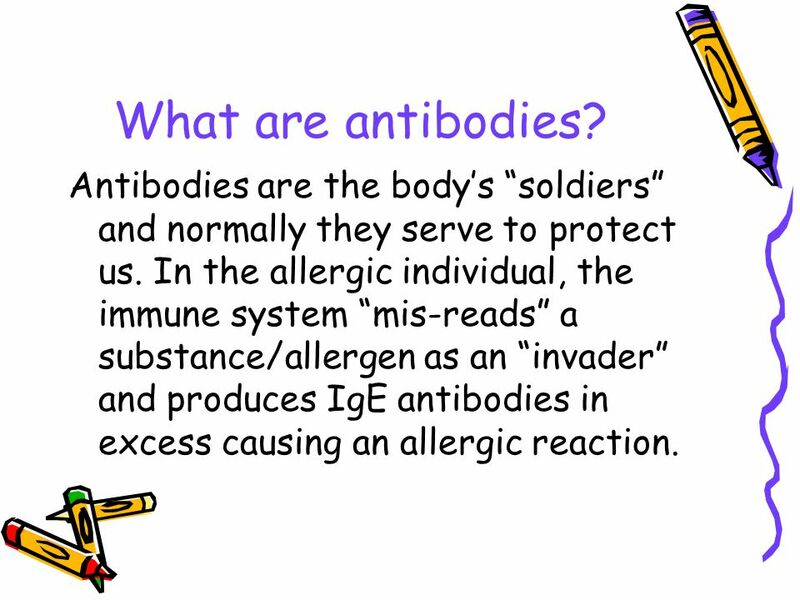 In the allergic individual, the immune system “mis-reads” a substance/allergen as an “invader” and produces IgE antibodies in excess causing an allergic reaction. 7 How are allergies diagnosed? 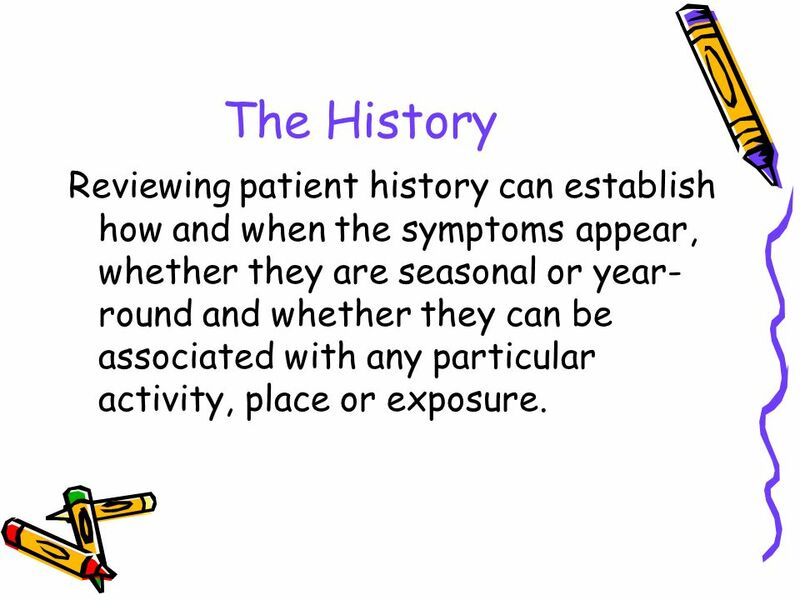 8 The History Reviewing patient history can establish how and when the symptoms appear, whether they are seasonal or year-round and whether they can be associated with any particular activity, place or exposure. 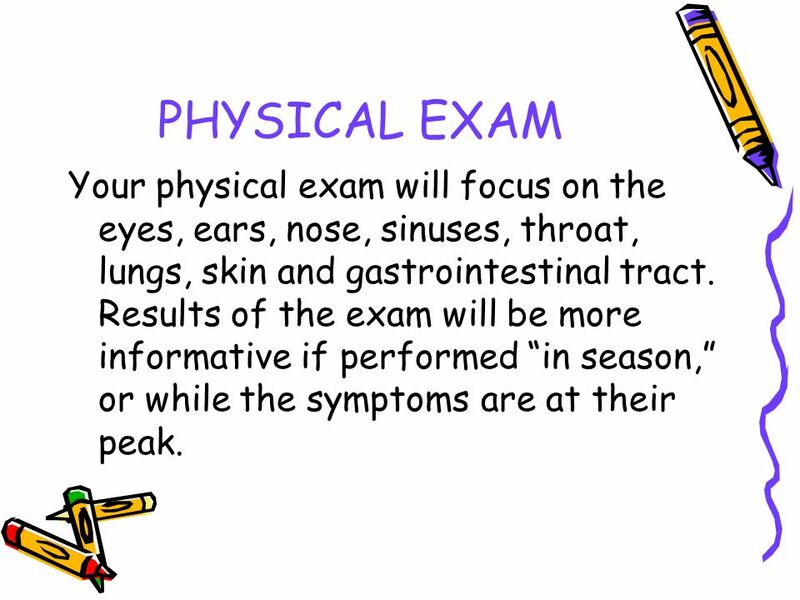 9 PHYSICAL EXAM Your physical exam will focus on the eyes, ears, nose, sinuses, throat, lungs, skin and gastrointestinal tract. Results of the exam will be more informative if performed “in season,” or while the symptoms are at their peak. 11 Why should a Total IgE be ordered? An elevated Total IgE may signal an allergic response outside of the allergen panel selected. 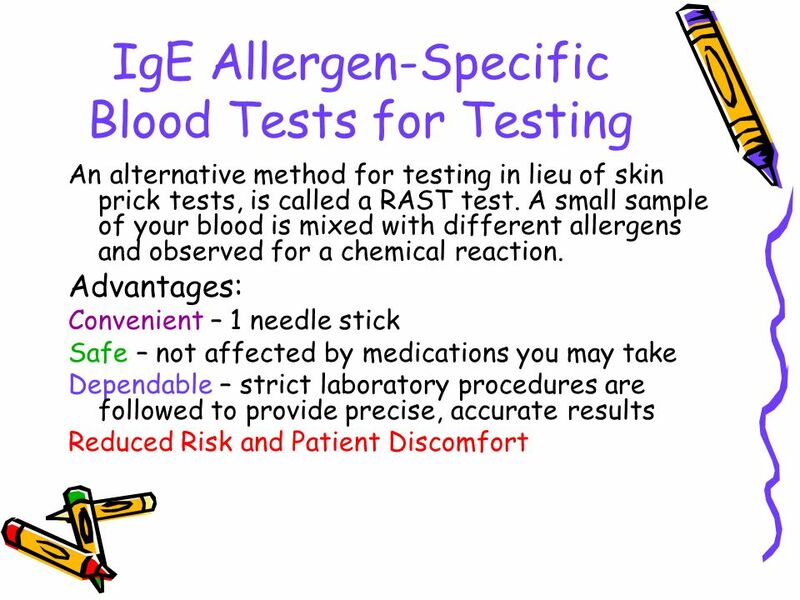 For example, your initial panel of IgE-specific tests may not indicate an allergic response. 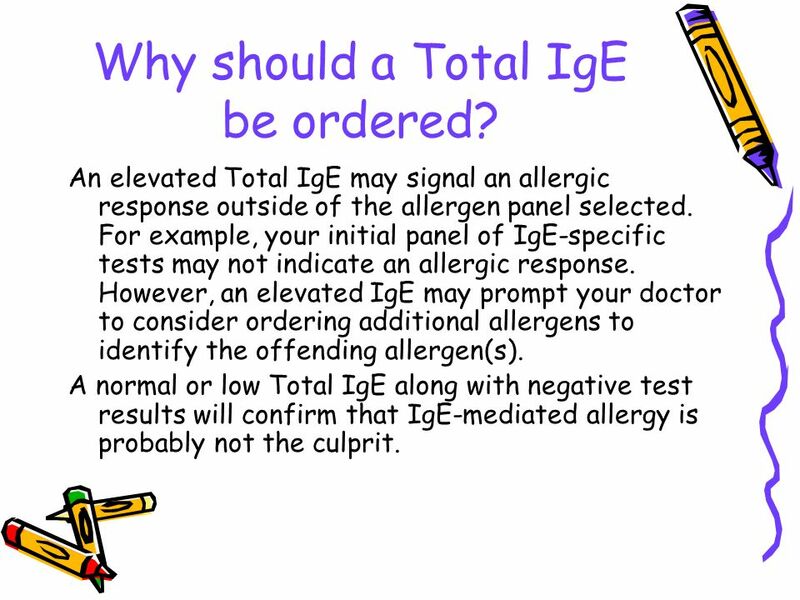 However, an elevated IgE may prompt your doctor to consider ordering additional allergens to identify the offending allergen(s). A normal or low Total IgE along with negative test results will confirm that IgE-mediated allergy is probably not the culprit. 12 How do you “get” an allergy? You can develop an allergy at any age. 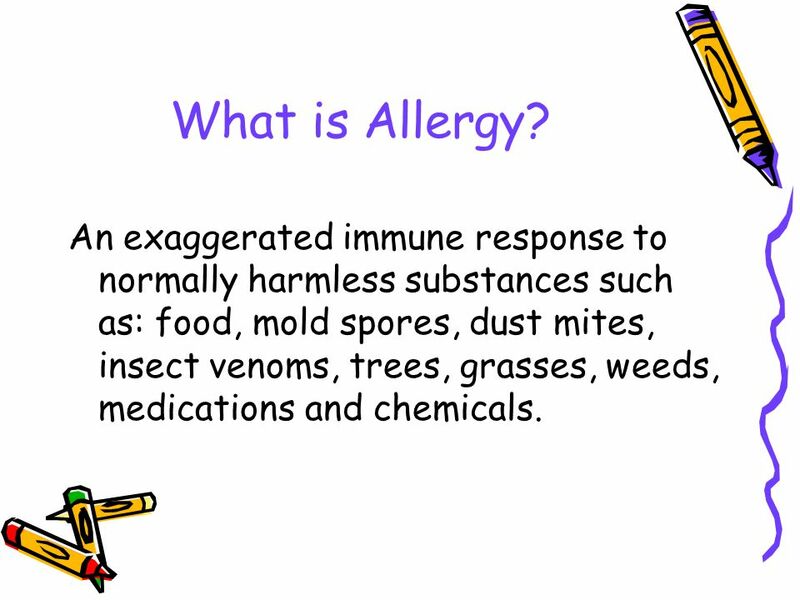 Usually, symptoms first appear in childhood after exposure to the offending allergen. You may have inherited a tendency to develop allergy. 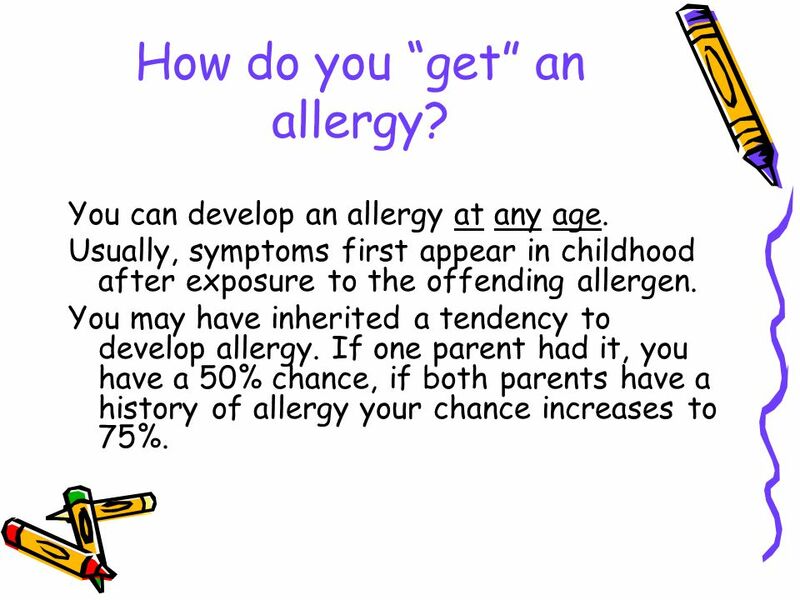 If one parent had it, you have a 50% chance, if both parents have a history of allergy your chance increases to 75%. 13 Are allergies more than just an annoyance? 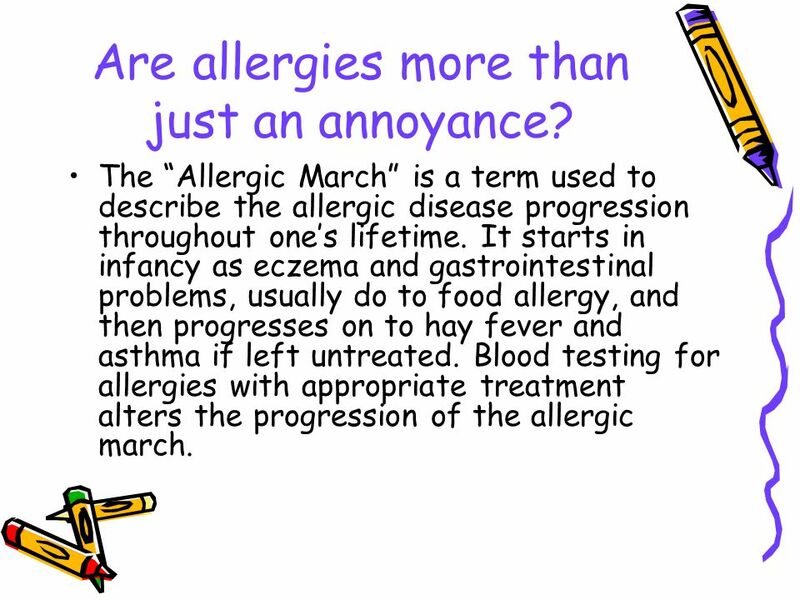 The “Allergic March” is a term used to describe the allergic disease progression throughout one’s lifetime. It starts in infancy as eczema and gastrointestinal problems, usually do to food allergy, and then progresses on to hay fever and asthma if left untreated. 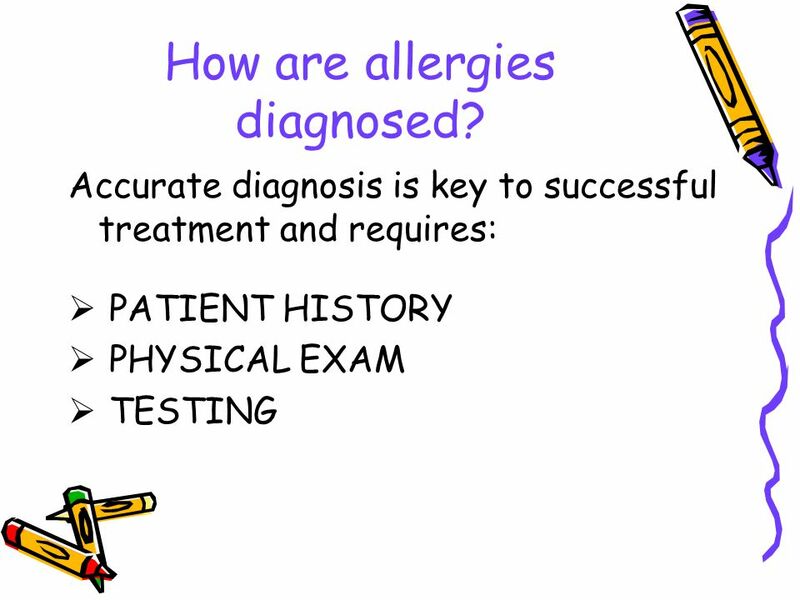 Blood testing for allergies with appropriate treatment alters the progression of the allergic march. 14 What can be done to alleviate my symptoms? 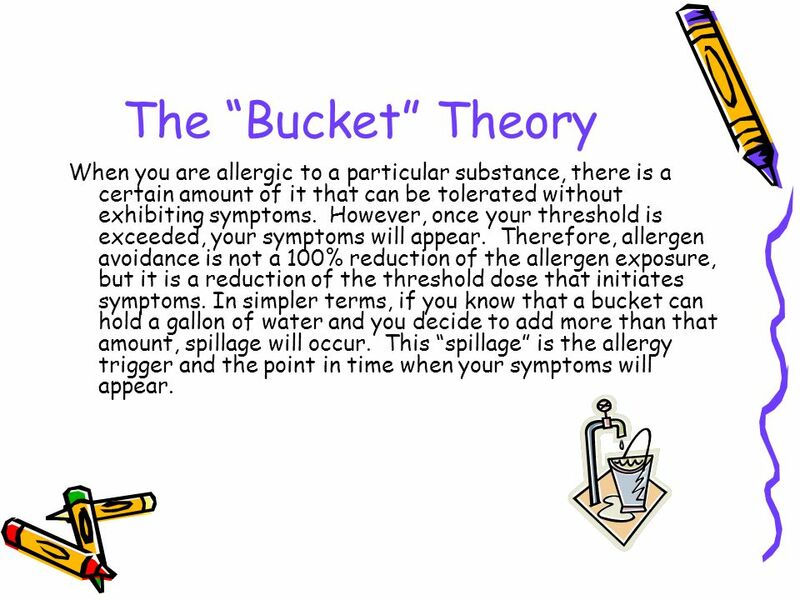 15 The “Bucket” Theory When you are allergic to a particular substance, there is a certain amount of it that can be tolerated without exhibiting symptoms. However, once your threshold is exceeded, your symptoms will appear. Therefore, allergen avoidance is not a 100% reduction of the allergen exposure, but it is a reduction of the threshold dose that initiates symptoms. In simpler terms, if you know that a bucket can hold a gallon of water and you decide to add more than that amount, spillage will occur. This “spillage” is the allergy trigger and the point in time when your symptoms will appear. 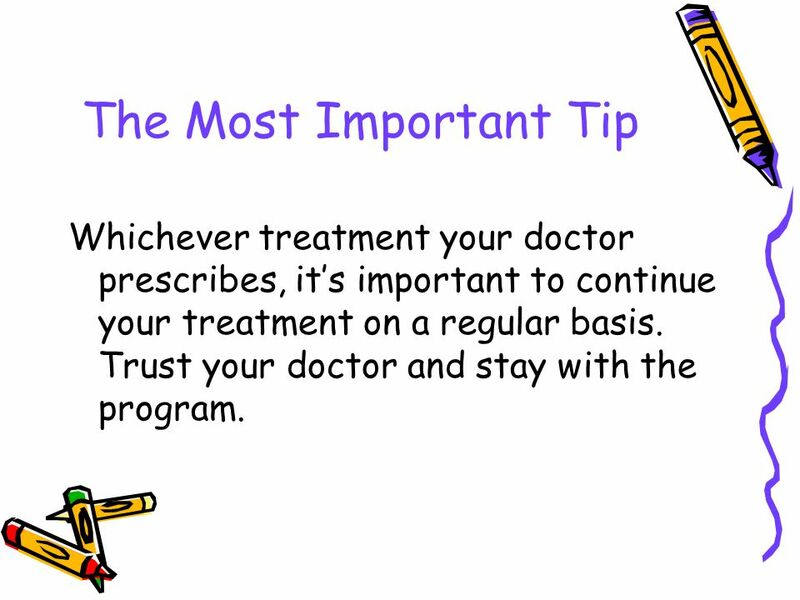 16 The Most Important Tip Whichever treatment your doctor prescribes, it’s important to continue your treatment on a regular basis. Trust your doctor and stay with the program. 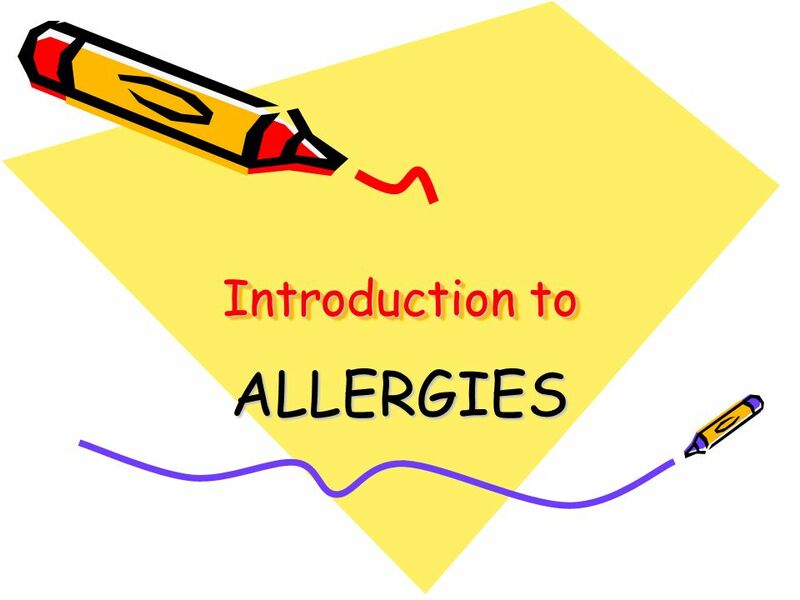 Download ppt "Introduction to ALLERGIES." ALLERGY. No. 1 Hypersensitivity An allergy is a reaction of your immune system to something that does not bother most other people. People who have allergies. Connect! Did you get a swine flu vaccination? What is a vaccination? C A SHINKWIN BON SECOURS GP STUDY DAY 28 JANUARY, 2012. Lesson 3 An allergy to pollen, called hay fever, is one of the most common chronic diseases in the United States. Experts estimate that 35 million people. Better Health. No Hassles. Hay Fever. Better Health. No Hassles. HAY FEVER Hay fever also called allergic rhinitis Unlike a cold, hay fever isn’t caused. Dr muaid I. Aziz FIMCS.  Definition: its an inflammation of the lining of the nose characterized by two or more of the following symptoms nasal obstruction. Cedar seeds are found in mountainous areas - most commonly in Arkansas, Missouri, Texas and Mexico. Although most cedars pollinate and cause allergy symptoms. The Immune System and Allergy William L. Houser, Jr., M.D. Allergies Aaron, Tyra, Cariane. Allergies An exaggerated response of the immune system Usually to substances such as food or pollen. ALLERGIES. What does an allergy mean? An allergy refers to an exaggerated reaction by our immune system in response to bodily contact with certain foreign. Allergies, Asthma, Diabetes, and Arthritis. Allergies Allergy- specific reaction of the immune system to a foreign and frequently harmless substance Sneezing. Very little information about allergy. Allergies are an overreaction of the body's immune system to specific substances that it misidentifies as harmful. Food Allergy Miriam O’Callaghan and Alex Coogan 4 Pearl Ms Cooney. By: Cassie Mattingly ALLERGIES IN CHILDREN.  Background on food allergies  Common food allergies  How reactions occur  Why reactions occur  Prevention. Allergy Plants. Allergies Disease of the immune system Caused by common everyday organism not foreign microorganisms About 20% of the US population suffers. In this chapter, you will Learn About… What allergies and asthma are and how they’re treated. What cancer is and how it’s treated. Different types of heart.